Exhibition catalogue University of St. Andrews Art History Department and the Crawford Art Centre 1990. 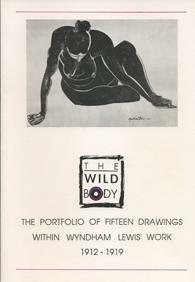 This rare exhibition catalogue features extracts from Catherine’s master’s degree thesis on the Portfolio of Fifteen drawings by Wyndham Lewis. With sections on The Ovid Press and the themes within Lewis’ work at this time, this a collector’s item for all Wyndham Lewis enthusiasts. Black and white illustrations.